Now that images of Ferrari's spanking new mid-engine V8 berlinetta -- the 458 Italia -- have hit the virtual wires, the problem with the outgoing F430 Modena becomes comparatively obvious: The F430 is thick-waisted, otiose, a slug, straining the seams of its red livery like an overfed Vatican cardinal. It didn’t seem so before – indeed, the sight of an F430 hit one’s brain-case like scarlet lightning and the sound of its flat-crank, 483-hp V8 could rouse long-dead relatives from their slumber. But now I see what a truck it was. 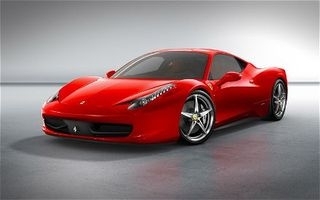 The 458 Italia – debuting in September at the Frankfurt Motor Show – is the slinkiest road-going Ferrari ever, with a fluid, flowing, barely-there bodywork that clings to the car’s chassis like a red silk scarf in an F5 tornado. Spectacularly low and wide, with a huge dynamic energy as the folds of the car come together at the rear-quarter panel (note the absence of air intakes over the rear wheel arches), the 458 Italia is a rolling clinic of Ferrari design cues: the Enzo tail lights and general posture, the 612 Scaglietti contour line, the sharkish snout of a Dino. And all of it sketched with lighter-than-air graphite. The lightness isn’t purely visual: the 458 Italia weighs in at 3,046 pounds, a feathery mass pitted against the car’s direct-injection 4.5-liter V8 (thus the name "458"), seven-speed clutchless manual transmission and Ferrari’s latest driving electro-dynamics, including systems-integrated versions of E-Diff and F-Trac, which help the car generate an astounding 32% more longitudinal acceleration out of corners. To unpack that a bit, it means you can get on the gas even earlier coming out of a corner and the car will instantly sort out each rear wheel’s max torque capacity. The factory says seven-time world champion Michael Schumacher helped with the fine tuning. Should be quite the roller-coaster. The 458 gets it done in a straight line too: 3.4 seconds to 62 mph and a top speed of 204, with the backing of the 562 HP at 9,000 rpm (52 hp more than the F430) and 398 lb-ft of torque at 6,000 rpm. And the electronically maximized brakes aren’t bad, either: 62 to 0 in a mere 105 feet... Read the entire article from the L.A. Times! Get Updated Value Estimates on Your Car. How Long Will a Hybrid Car Battery Last? What Motor Oil Is Best for Your Car? Car Brakes: How Do You Know When to Change Them? What Does The Check Engine Light Mean?